I have long expressed strong opinions about the importance of diversity in the workplace, was the co-founder of an organization devoted to making technology more accessible to women and believe the “likability double standard” almost all of us hold about ambitious women vs. men needs to be smashed into a million pieces. And yet, I’m here to confess: I have judged Sheryl Sandberg. I, like many of her critics, wondered whether, with the release of her new book and media tour, she had chosen a hot-button issue to advance her professional goals. I judged her as someone who was wealthy and out of touch, someone who had simplified a complex problem into a two-word catchphrase. I did not see her as someone who was doing good – I saw her as someone with a personal agenda. 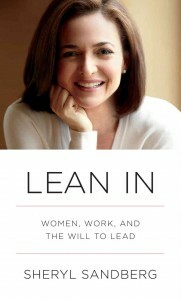 Taking the plane back from South by Southwest today, reading the continued coverage of the release of Sandberg’s book, Lean In: Women, Work, and the Will to Lead, and thinking about my own ambivalent reaction, I came to a terrible, shocking realization. I had defaulted to the success/likability double standard Sandberg references so frequently: the more successful women are, the less people like them. I judged Sheryl Sandberg, someone I have only met once, (and questioned her motivation) because I didn’t have warm, fuzzy feelings about her. Even though it feels quite awkward, this is something I think it’s my obligation to disclose. If a female founder and CEO, someone who actively talks, thinks and speaks about diversity issues, can fall into judgement of a prominent, successful woman in this way, what are we doing to other women in the workplace and elsewhere? I’ve seen everything from Mashable’s subtle mockery with “Gina Bianchini On Leaning In So Hard You Fall Flat On Your Face” to CNN’s hyperbolic and overly dramatic “Facebook’s Sheryl Sandberg Suddenly In Crossfire” – the judgement is pervasive, and the whole conversation is truly a parable that illustrates an important part of Sandberg’s theory. I’ve come to the conclusion that the debate around and reaction to Lean In is an amazing chance to recognize our own biases and get some corrective glasses. Whether you believe Sandberg has it right or not, she has exhibited tremendous leadership and started a timely and nuanced discussion around just what it is that holds women back (proposing that it’s often women themselves – something I don’t disagree with; how to get out of your own way is something everyone needs to learn). A renewed examination of how we work and relate to one another (men and women) is something that must happen if we’re going to get to anything like parity in the next hundred years. And finally – the most deliciously ironic part of all this – one could credibly argue that the continued sharp criticism of Sheryl Sandberg and her new book is actually proof that she’s right.